Private tours available. Reservations are required. Everglades Grand Heritage and Birding Tour - This is the most extensive tour of Everglades National Park offered. Approximately seven hours in duration, it culminates with sunset over the water. Your Naturalist Guide will safely and comfortably lead you on a personalized, interpretative ecological and historical tour into areas of the Park that few get to experience. You will go through the 10,000 Islands, the Everglades Tidal Rivers and Flats, the famous Wilderness Waterway, remote Mangrove Creeks and Tunnels, Coastal Island Beaches and remote historical sites in Everglades National Park. Limited to just six guests, your experience will be varied and dynamic. It will include not only the boat experience, but kayaking and walking some of the most unique interesting and remote areas of the Park. You will make frequent stops at points of interest and comfort facilities throughout the day. Be sure to bring your lunch and refreshments to enjoy at a historic site or on a remote barrier island beach. One of our favorite places for lunch is the historic home site of "Bloody" Edgar Watson immortalized in Peter Matthiessen's book, "The Killing of Mr. Watson." Not to worry, the state-of-the-art kayaks are very stable and easy to paddle and you do not need prior paddling or kayaking experience. We use both single and two-place kayaks so you can paddle together with a friend or partner. Since they are very quiet, stealthy and non-intrusive, the kayaks are an excellent tool to get you close the wildlife. Each day is different in this wonderful wilderness and so each tour is also different. Your captain and naturalist guide is a full-time professional and is on the water most everyday. He/she will tailor the day's tour to the local conditions at the time, the season, and where the wildlife chooses to be. This tour is a wonderful eco-experience, but it is not always available, especially on short notice. It is very popular with returning guests, so it is important to book this tour as far in advance as possible. We do limit this tour to just six guests, but if you prefer a private experience, simply give us a call. Wizard Creek and The Watson's Place. One of our favorite destinations for birding and photography on the Grand TOUR is Wizard Creek. It is one on the more unique areas within the western Everglades National Park. A creek that runs from the Gulf waters through the mangrove wilderness into the backwaters of the Wilderness Waterway; it is a "super-highway" short cut for both fish and wading birds. While the place is always rich in fodder for the birds, sometimes it is like "fish soup", alive with wading bird feed. The area is always teeming with life and is a great place to bird most any time. However, when the area is "soupy", the concentration and variety of water fowl is amazing. The birds can be distracted in the creek since they are intent on feeding. The stealth of the kayaks can really help you observe their activity up close. Be sure to bring your cameras in addition to your binoculars. To get there, we run through the mangrove backcountry waters of Everglades National Park . We depart from the 10,000 Islands, at Chokoloskee Island, and we travel up the Lopez River, though Crooked Creek, into Sunday Bay and then along the Wilderness Waterway above the headwaters of the Huston River through Chevalier and Cannon Bays. Along the way we stop at various points of interest as well as make stops at comfort facilities. 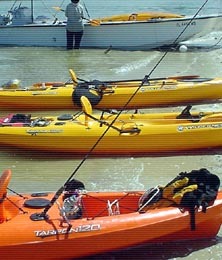 At the mouth of Wizard Creek, we deploy the kayaks for a 2 to 2 1/2 hour paddle into the Creek. It can be a spectacular area for birding and photography. After the paddle, we will motor the Chatham River stopping by the Historic Watson's Place, usually for lunch, and then on to the mouth of the Huston River. We return to Chokoloskee along the Gulf Barrier Island beaches and shorelines. But first we typically deploy the kayaks a second time and access one of the remote island beaches for a unique hands-on experience. On the return trip, timed with the setting sun over the water, we motor past Duck Rock Cove, the Three Sisters, Pavilion Key, Rabbit Key, across the mouth of Chokoloskee Pass into Sand Fly pass and then back into Chokoloskee Bay. The boat trip alone is wonderful and a great way to experience the Park. The Grand Tours leave from JT's Island Gallery on Chokoloskee Island which is located just 3 miles from Everglades City. The actual departure time is varies throughout the year, but your captain will contact you ahead of time to coordinate the tour. You should budget a full eight hours of your day and expect to return after the sunsets. $299.95 per adult; Children under 12 are 1/2 price. Prices excludes Florida sales tax.